1994 Kenworth T800B 4, 000 gallon T/A Water TruckWater trucks are commonly used in mining applications, primarily for dust control. Water trucks usually consist of a series of spray nozzles equipped with the mechanics to pump and spray water to remove overburden or to hydrate mines when they become dry. The trucks are different from a typical truck in that they must be able to contain a large volume of water, requiring special tank specifications and mounting apparatuses to include spray nozzles and associated equipment. Today, however water trucks are also used for various other reasons. The construction industry uses them for compaction, dust control and fire-prevention and protection. The entertainment industry also uses water trucks for street wet downs, fire control stand-by and many other reasons. Water trucks are used also used by the fire-fighting industry in battling forest fires. A special type of water truck called a potable water truck is a water truck or water tank trailer that supplies bulk water for human consumption to people living in areas that don't have access to a public water supply or a water well. They may also be used for filling up swimming pools, fire-camp service and in major sporting events. 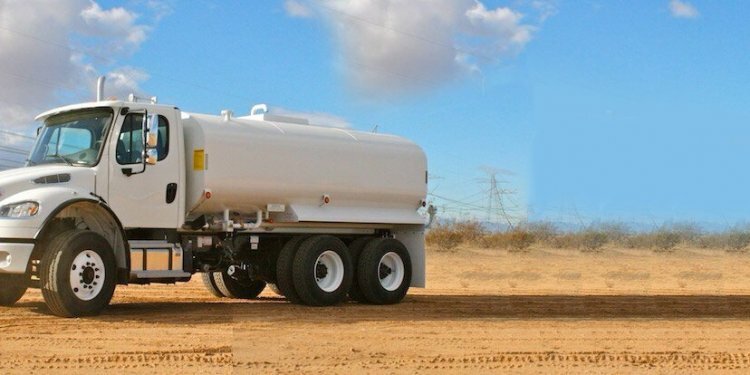 Potable water trucks are available with 1, 000 gallon and 2, 600 gallon tank capacities. Before the age of modernized mechanics, watering systems were devised in other ways. A hydraulic monitor equipped with large nozzles would spray heavy quantities of water in a constant stream against rocky hillsides in order to remove the overburden covering the sought-after minerals in an open-pit mine. The monitor, also referred to as a “Little Giant, ” consisted of a single nozzle at the end of the line. Water was collected from the mountain and any nearby resources and dumped into the hydraulic monitor. Once contained, it would travel in restricted amounts through small pipes and would be relayed in a steady stream, usually three to eight inches (7.6 to 20.3 cm) in diameter. The hydraulic monitor was hugely successful as the outflow of water exposed small amounts of gold after turning a hillside into a slew of mud. When the dirt from the overburden was removed, a series of sluice boxes were used to collect the gold.